"For over 50 years the airmen of the 333d Fighter Squadron “Lancers” have flown five different aircraft in operations around the world. The USAF activated the Lancers on December 8, 1957 at Seymour Johnson Air Force Base, North Carolina and equipped them with the F-100 Super Sabre. Three years later the Lancers transitioned to the F-105 Thunderchief and served admirably during five years of combat operations in Vietnam. The Lancers then returned to the US and trained student pilots in the A-7D Corsair II for five years and then became the first squadron to fly the A-10A and OA-10A Thunderbolt II. The 333d Fighter Squadron returned to Seymour Johnson Air Force Base in October 1994 and started flying the F-15E Strike Eagle in order to provide the highest quality F-15E aircrew to operational squadrons in support of combatant commander objectives. Known as “The Best Squadron on the World,” the 333d is the largest squadron in the US Air Force and the Lancer airmen are the most experienced aviators in the Combat Air Forces." To the left of the text is a beautiful image of the Air Force approved emblem of the 333rd Fighter Squadron. This is the patch worn by Squadron members every day of the week except Friday. To the right of the text is a beautiful image of the “morale patch” worn by Squadron members each Friday. Each "RETURN OF THE LANCER" print has been individually signed by the extraordinary artist Ronald Wong. Mr. Wong is well known for his beautiful and historically accurate depictions of modern US Air Force and Royal Air Force squadrons and wings. 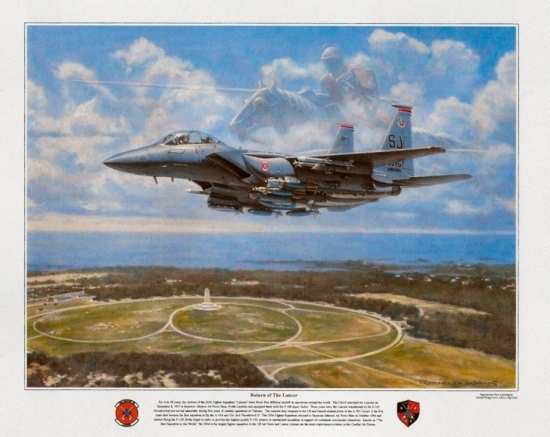 This is Ronald Wong’s first print for a squadron from the famous 4th Fighter Wing. Lt Colonel Jeff "Rosie" O'Donnell. Lt Colonel Tom "Polo" Palmer.